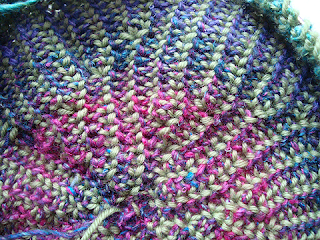 I've been learning how to do brioche stitch, also known as fisherman's rib, using this web site. This is a seriously cool stitch pattern - each row is knit twice, with first the odd stitches being knit / even stitches slipped, and then the even stitches being knit / odd stitches being slipped. It's a bit more tricky than that, but that's the basic idea. And the reason for this, apart from always liking to learn new things? I simply had to make a Windmill Beret (Rav link) by Nancy Marchant (or pretty much any of her beret patterns, really - all free, on the same web site above). Isn't it stunning?! 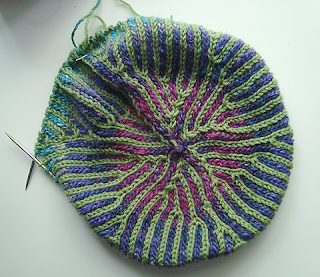 I'm using 1 skein of Noro Silk Garden, and 1 skein of Naturally Loyal (leaf green). 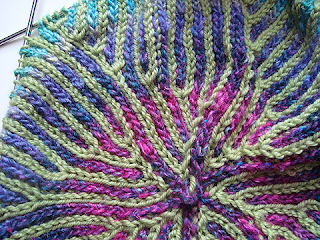 It's knit from the top down, and the first few rows are very fiddly - i think I had to restart about four times. In the end, I found using a long circular needle (magic loop) much easier than DPNs. It takes a fair bit of concentration initially, but once the technique 'clicks' - which it did for me around Row 10 - the whole process is much faster. I've got to this point in three days ... hope to finish it this weekend! And I think I'll be making more of these! It's beautiful. I love the way the colours wind around the green and vice versa!! I understand the principle, but not the practice!!! It looks great - love all those colours together. ooooh. i think I might have to try that. Neat. Oh, I love brioche! And Nancy's website is such a great reference. She has a Rav. brioche group, but it's pretty quiet right now. it's fantastic! I must learn!